View cart “100% Polyester Velvet in Heather” has been added to your cart. In both our Bridport and Yeovil shops we offer a bespoke hand-made curtain make up service, along with roman blinds and cushions as a few more examples. With a local team of self-employed makers at each shop we can offer a wide range of high-quality hand-made, soft furnishings for your home at competitive prices. We are proud to say that we have a huge range of fabrics to choose from and our friendly and knowledgeable staff are happy to guide you through choosing the right fabric for you. We are also able to offer a measuring up service in the local area for people who need it, we can also offer advice on this in the shop if you just need a little guidance. Also see our guide for measuring curtains here. Here are some of the latest bespoke curtains with matching scatter cushions we have made for a happy customer. Take a look at this lovely new fabric range, freshly arrived in store! Contemporary designs in subtle colourways are printed on the softest soft-touch fabric you can imagine. This range is perfect for bringing a fresh, crisp, understated style to your home when made into cushions, curtains and roman blinds; ideal for your spring homemaking project, or our expert makers can create any of your soft furnishings to your complete satisfaction. Come in to Livingstones to discuss your ideas, and borrow the hanger to try the fabric out in your home; it’s available to order from us now. We handmake beautiful soft furnishings at Livingstone Textiles and we are very proud of our products and services but did you also know that we supply and fit curtain poles and rails? We have a selection of up to 3 metre long metal poles with brackets and finials in different colours to finish off your room. We also supply and fit Roman Blind cassettes and curtain tracks. Nowadays you can choose from a selection of plastic or metal tracks to suit your window or door, they can be bent around corners and you can even have ceiling mounted tracks to match in with the colour of your paintwork. This means you can transform a bay window with a curved track, even curving it back around the reveal enabling you to hang a curtain that sweeps effortlessly around the bay but sits well away from the windows without taking light from the room. Shown below are some pictures of a ceiling mounted track that we recently fitted from which to hang a draught excluding curtain with a thermal lining. The curtain had to hang across a rear door to the property and a stairway so it was important that the curtain could be pushed back on either side as required. The curtain was made from a heavy wool fabric and with the weight of the thermal lining as well it was quite a substantial curtain. However it was no problem for our mini professional curtain track as it’s made from strong and durable metal and once secured in place it can easily bear the weight of heavier fabrics. For more information on pole, rail, blind and track fitting contact us here. We’ve all done a fair bit of sofa surfing over the Christmas period and you may not have been entirely happy with the comfort afforded you. Some of you may have even bought a new settee in time for Christmas but may discover that the bounce in your cushions isn’t really all that great. Foam has a shelf life and although it will last many years, eventually it will start to deteriorate and crumble and you will need to think about replacement cushions. Many manufacturers of synthetic sofa cushions now also use only a thick wadding in the covers. A sofa with foam inserts will not be bought at a discount sofa sale because they cost a lot more to produce. Your wadding cushions will seem fine for a few weeks but very quickly you will notice that they sag and squash into nothing because the polyester will not bounce back to its original shape. To rectify this we offer a bespoke service that will make your old or new settee bounce back in to life. We cut foam exactly to the size and shape of the cushion cover and then wrap it in thick wadding. In this way you get all of the bounce and shape retention from the foam with the addition of softness and comfort from the wadding. To finish up we wrap the whole squashy sandwich in stockinette for easing your cushions back into the covers – without a hot sweaty battle. Is your foam still ok but your covers are looking a little tired? Pop in and talk to us about renewing your existing sofa, especially if it is an inherited or memorable piece. We offer a full and bespoke upholstery and re-cover service from our workshops in The Long Room at Livingstone Textiles,Bridport Dorset. If you would like information on sofa cushions please contact us and we will be happy to give advise or a quote. Maybe you’re thinking about joining one of our sewing workshops in Yeovil and haven’t used your machine in a while, or maybe your trusty workhorse is struggling with your latest sewing project? If so, don’t get mad, get a service! All makes of machine are serviced or repaired by our talented repairs man Mark. He travels over from Bristol once a month or so, to tend to your ailing machines, and in most cases will fix them on site and on the day. He will repair overlockers too. For an initial deposit of £10 (non-refundable) Mark will initially check that the machine is serviceable. The charge for a service is an additional £49.90 and if any parts are needed, Mark will give you a ring before spending any more of your money. Mark services the machines at our Bridport store, but you can drop off and collect your sewing machine at Bridport or Yeovil. If your machine is unfortunately deemed unrepairable, you have the option to donate it to Tools for Self Reliance – we also accept donations of working, unwanted machines for this fantastic charity at both of our stores. This beautiful new fabric from one of our regular suppliers is a celebration of autumn depicting leaves and berries in vibrant jewel colours. Made up into a pair of Roman blinds they will compliment our client’s dining room windows and tell a story of the seasons swinging from an English summer into autumn. This cotton fabric in the featured Rust colourway can be purchased in our shops for only £20.90 per metre, or see below to order online. We also offer a full make up service with our skilled seamstresses. We’ve not had this new range in for long but it’s already proved incredibly popular. We’ve made up a lot of orders for our customers and it’s continues to be a popular choice for scatter cushions. Our latest order was for this pair of curtains using two widths in each curtain so they’ll be lovely and full. We don’t advise anything less than double fullness so you achieve a more luxurious window dressing and you can find out more about calculating your fabric requirements here. Of course, if you’re not confident with that then any of our trained staff are on hand to help you either in person, over the phone or via email. We’ve used the Camille range in this project and the colourway is Pervenche. The designs are evocative of watercolours by the Impressionists and have a softness to the printing that mimics a real painting. This is all achieved with the digital printing process and we’ll be telling you more about that in the future. A wider range of designs, colours and fabric uses are shown below. Long, dark evenings call for cosy curtains, and these beauties that one of our talented makers recently finished for customer certainly fit the bill! The stylish woven fabric is deliciously heavyweight and hangs beautifully, adding warmth to your room without feeling oppressive. We have this fabric and others in the same range, including a fabulous circles design, which we all like very much. Pop in and have a look at the range, pick up some samples, or order some curtains of your own! This fabric is also suitable (and fabulous) for cushions and sturdy enough to use for upholstery. Lynne has recently joined our team here at Livingstone Textiles Bridport as our handy lady. She will be helping us by hanging curtains, fitting curtain poles and tracks and roman blind cassettes etc and will also be able to help out cutting foam orders from time to time, which is great! So, if you’ve got a pair of curtains and track on order and you would like us to arrange for them to be hung then please get in contact with us at Livingstone Textiles Bridport – 01308 456844. We cut sooooo many pieces of foam for our customers at Livingstone Textiles and we have a re-use or re-cycle policy where we every member of the team makes maximum effort to minimise waste. Part of our efforts to do this include recycling all of our packaging, both plastic wrappings and cardboard and also our foam. When the foam is delivered to the shop it arrives in enormous sheets measuring over 2 metres square! This is manhandled up the 3 flights of stairs to our roof where it is carefully unrolled and laid out for use. We then cut your requirements from the sheets in a way that creates as little waste as possible. Obviously, you all want different sizes and shapes, from window seats to sofa cushions and dining chairs to campervan beds so we always generate odd pieces that we cannot make use of. These offcuts are saved up and the really small and hopeless pieces are returned to the foam company where they are chopped up into little pieces and used to make the coloured chip foam that we also supply, but we also have other pieces left over that can be quite a useful size and because reuse is even better than recycling, we pop all of these into a basket that we put outside our shop door every day that we are open. Folks can then come and choose what they need and make use of it when packing parcels for safe transit, stopping draughts and wedging into gaps in sofas or caravan beds for better comfort. We only request a donation that we collect for Harbour House in West Bay, for the benefit of the residents. Follow the link for more information on our foam and services we can offer you. One of our customers has had our upholstery department transform this lovely junk shop chair using our delicious zebra pattern chenille fabric. We think the finish is just fantastic, and you can see how the upholsterer has centred the fabric carefully so the zebra pattern looks just right. This quirky low slung no-leg chair is now updated with an equally quirky fabric, giving a totally individual finish which will look amazing in the customer’s home. Even better, a project like this will not take much fabric – a single metre of fabric is often enough depending on the pattern. If you are inspired to try a project like this yourself you can now purchase the fabric directly on our website by mail order, by clicking on the picture below. Curtains made with interlining or ‘bump’ are much fuller and more luxurious than those made with just lining alone. The bump literally ‘bumps up’ the fabric making it thicker and has the added quality of providing a layer of insulation against cold windows. Interlined curtains are an especially popular choice in a house with older windows and those with listed building status but are also used in more modern homes where an appearance of luxury is required. The window size must be taken into account when considering interlining because they can easily swamp a room with too much volume. The fullness of the finished curtain also has to be taken into account but don’t worry because all of the staff working across Livingstone Textiles are trained to advise you in the appropriate way. Find out more here. When we make your interlined curtains we use a more involved method of making where the interlining is first locked into place with Herringbone stitch under the side turns of the fabric and along the seams of any joins. A picked hem is then worked through both the interlining and into the show fabric where a tiny line of equally spaced stitches will be barely visible. Finally, the pencil pleat heading tape is sewn into position making the curtains look really plump and luxurious. You can buy this elegant grey bird fabric in our shops and throughout September you will receive free curtain lining* with any curtain or blind order. This lovely old G-plan chair was given a quirky and stylish makeover by one of the fabulous upholsterers in the workshop attached to Livingstones. The customer chose this richly-coloured upholstery fabric, which is a personal favourite of mine. It’s a playful geometric woven fabric in gorgeous colours that works equally well in a classic or modern setting, and will definitely stand the test of time. While in the workshop this treasured piece of furniture was also repaired to stabilise the joints and the wood was polished to retore it to its full beauty. If you’ve got a piece of furniture that you would like to see reupholstered and bought back to life by a skilled professional, then do come into the shop to discuss it. We’ve got a huge range of fabric to choose from, both to order and on the roll, and we’ll work with you to ensure you get exactly the look you want. You may already be aware of the sewing machine repairs and maintenance servicing that we offer our customers to help them keep their machines in tip top condition but you may not be aware of what might happen to your machine when its past its best and you decide that its not worth throwing any money at. Many of our customers leave their old machines with us when they’re done with them and we’re very proud to support communities in Africa to help reduce poverty by working with Tools For Self Reliance. This marvelous organistaion works to enpower communities by providing tools and the training they need in order to earn a living and create a positive impact within their communites. All of your unwanted and broken sewing machines and overlockers are collected by one of their volunteer tool collectors when we have a little herd of them. All of the serviceable parts are then used for refurbishing or repairing other machines by even more volunteers in the UK before being sent out to places like Ghana, Malawi, Sierra Leone, Uganda and Zambia as well as many more. 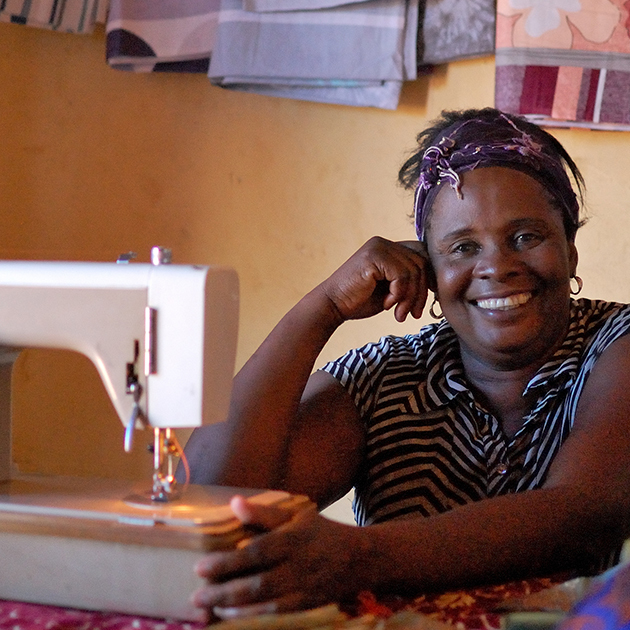 Once the machines are out in Africa, they are used by people like Uma Jalloh as she trains as a tailor and learns the skills that she needs to contribute to her brothers household. Uma escaped an arranged marriage at 14 and had never been to school until she got involved with TFSR. You can read her story and others here. Livingstone Textiles has worked closely with Tools for Self Reliance in Southampton for many years now. If you would like to get involved with volunteering, you can find out more here You could also share this page to your Facebook Feed and help us to raise their profile in the UK. Alternatively, just hand in your old and broken machines and we’ll make sure they get into hands that will really put them to good use. At Livingstone Textiles we are proud to have excellent curtain makers working for us. In Bridport we have 3 makers covering West Dorset, one in the popular town of Beaminster, one in Charmouth and one in Abbotsbury. They will come and measure up for your new curtains and blinds, discuss your requirements for soft furnishings and will happily show you samples as well as books of fabric. They will also quote you for box cushions and window seats on request. Call us on 01308456844 to arrange a visit. We have a curtain maker working from our Yeovil shop as well, please call 01935422631 to arrange an appointment if you live in the South Somerset area. Combining stripes with a pattern is always a good thing but its not alwasy an easy thing. We have a smart hanger that does the thinking for you and its put together in colour blocks so the only thing you have to do is match it to your colour scheme. One of our customers has bought a brand new house in Axminster and has a new grey suite of furniture. She has lime green cushions to cheer it up but wanted something bright but smart at the windows. We helped her to select from this hanger and she chose the pink combination to be made up into Roman Blinds for a large bay window. The main fabric is called amulet and it is all embroidered onto a linen look cotton. The lattice is worked in long grey stitches and the circles are heavily embroidered in a pink spiral. Edging the embroidered fabric with pink the woven stripe borders makes the blind look smart and picks out the pink embroidery. The maker lined the blinds in stone lining and used the stab stitch method to hold the materials together. This method can be used when embroidery might make it hard to achieve very straight stitching on the show cloth. Are you wanting to make a special gift this Christmas but are not sure where to start? Not sure how much fabric, or how much piping you might need? Or do you know someone who loves making things and want to give them a present they will love? We have produced a “cushion pack” to take out the stress of making your cushion, all you have to do is sew it together, and we have helped there too, by production a step by step guide on how to make your cushion with one of our packs. Doing on of our packs will give you the skills and abilities to make you want to sew more and more. On our web shop, you will have an ability to choose from 7 different fabric panels that will make up your cushion with designs including dogs, sea, spots, tape measures, birds, wellies and Egyptian. you will also be able to choose from 17 different colours of piping. If you would like a sample of any of the materials mentioned on this page please contact us with your details and information on the material or fabric you require and we will be happy to help. We think our makers at Livingstone Textiles are very talented people, they can take our fabrics and make the most beautiful things, whether it’s turning the fabrics into a beautiful pair of curtains, roman blind or cushions. They can also make things that are a little bit special. This moses basket has been transformed into a beautiful white fresh looking bed for a special baby. We can cut new foam for the mattress, and add new wadding to the sides and we have a range of fabrics that you can choose from. If you have something that you would like upholstered, recovered, remade or would like something completely new out of one of our fabrics then ask a member of our team and we can see if we can help.